We are very satisfied with online availability of our fleet through the Booking Manager System. It also allows access, connection and correspondence with large network of worldwide charter agencies and individual clients. Asta Yachting has been operating successfully for more than 20 years and it eventually became one of the leading charter companies in Croatia. They are located in Sukošan, the central position of Adriatic Coast with the fleet of 58 yachts which includes different types and sizes of motor boats and sailing yachts. At the very beginning, Asta Yachting recognized that essential to success and customer satisfaction is a solid and reliable support, as well as capable and friendly staff. Asta team employees are sea enthusiasts with the passion for sailing themselves, experienced to make the sailing holiday comfortable and relaxed. Asta Yachting office and fleet is based in D-Marin, Marina Dalmacija, which is the largest nautical center in Croatia. Its favorable central position, allows guest to easily reach any part of North or South Adriatic in a short time. The impressive fleet handled with care and the highest maintenance standards, includes 49 sailing yachts and 9 motor boats ranging from 2 to 6 cabins. A diverse fleet of brand new boats, as well as economy boat models surely provides optimal choice for various needs. The recipe for the perfect sailing holiday is a mixture of well maintained yacht and efficient service on the sea and land. In order to ensure hassle-free holiday, Asta Yachting yachts are equipped with VPN mobile phones, connected with their staff so guest can reach them anytime, free of charge! Intervention team provides technical support the whole time during the sailing trip for any unexpected situation at the sea. 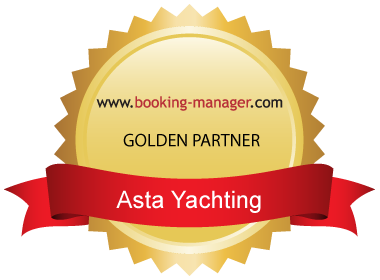 At the very beginning, Asta Yachting has chosen Booking Manager to promote themselves and smoothly handle a lot of administration work that such a large fleet requires. Using Booking Manager back office system allows Asta Yachting to increase the productivity with contract and invoicing automation, advanced financial analysis and payment tracking. In addition, it allowed them access, connection and correspondence with the large network of worldwide charter agencies and individual clients and empowered them to effectively maintain client relationship management. By recognizing the benefits of partnership, Asta Yachting eventually has chosen Booking Manager as an exclusive booking system to support their market growth strategy. Furthermore, in cooperation with Booking Manager they developed a professional website which provides detailed availability of their fleet in real time. Thanks to Local Booking Manager being integrated to Asta Yachting interactive website, customers are able to see new offers, check prices and discounts and book online in real time directly from their website and Facebook page. Providing a much faster and accessible way of booking within few mouse clicks for anyone, anytime enhanced even more Asta Yachting exceptional service. For more information check Asta Yachting website.